Summer 2016 has arrived and with it comes hot temperatures and a "hot" season of fundraising activities to benefit the work of St. Francis Food Pantries and Shelters. Some of these include: new projects, partnerships and much anticipated annual events including our 17th Annual Theatre Event featuring Disaster! the Musical and 18th Annual Golf For Hunger & Pool Party and Swim For Hunger. On Thursday, May 5, 2016 we honored Peter G. Riguardi, Chairman and President, New York Region, Jones Lang LaSalle at our annual Theatre Event. This year featured a performance of the Tony-nominated musical Disaster! on Broadway. Seth Rudetsky, who co-wrote and starred in the show, presented our honoree with the St. Francis Award on-stage following performance. The evening also served as a memorial tribute for Augustine DiGiacomo and John Thomann. 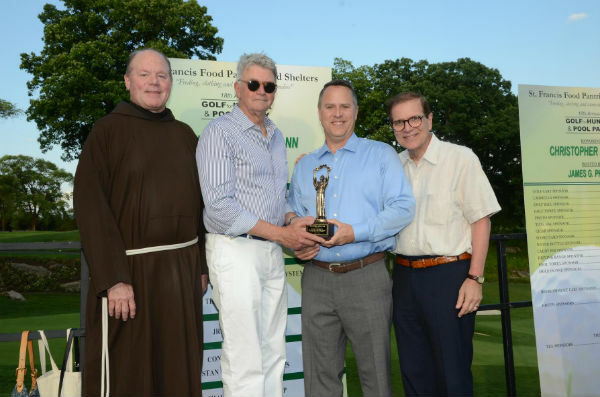 After being rained out twice last year, this year's Golf For Hunger & Pool Party took place on Monday, June 6, 2016 at Bonnie Briar Country Club in Larchmont, NY without a hitch! Chris Hillmann, President/CEO Hillmann Consulting was honored at our 18th Annual event. This April marked the month-long return of our Mother's Day Diaper Drive for 2016 and our mission to distribute over 25,000 diapers for babies in need. The New York Mets organization provided us with complementary baseball tickets to a game so that we could give group of seniors an enjoyable night at the ball park! Our "PB&J Days" Program continues to be a success with returning and brand new corporate volunteers rolling up their sleeves to make peanut butter and jelly sandwiches. Volunteers from Macy's assembled two hundred Easter Dinner baskets for students of a public elementary school and local senior center, providing recipients with a hearty holiday dinner. This Summer we look forward to partnering with past supporters, welcoming new volunteers, undertaking new projects, celebrating new milestones and so much more. 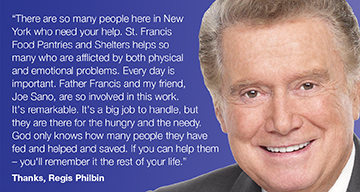 Don't forget to show your support on social media by using our hashtags: #StFFP, #DoodleForHunger and #SpinForHunger.